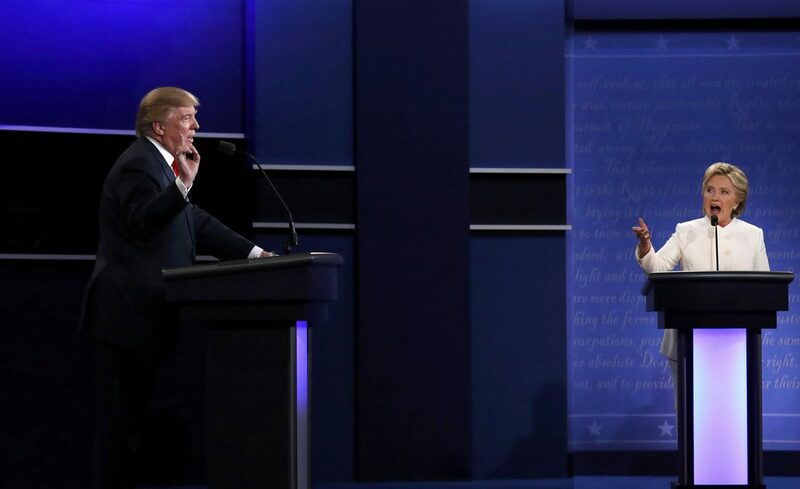 WASHINGTON (CNS) — In the final presidential debate Oct. 19, Republican Donald Trump used his most explicit language to date to denounce late-term abortions. Trump made those remarks after Democrat Hillary Clinton, answering the first question from moderator Chris Wallace, restated her support of the 1973 Roe v. Wade decision that legalized abortion virtually on demand, and she pledged continued support for Planned Parenthood. “If you go with what Hillary is saying,” Trump responded, “in the ninth month, you can take the baby and rip the baby out of the womb of the mother. Just prior to the birth of the baby. You can say that that’s OK and Hillary can say that that’s OK, but it’s not OK with me. “Because based on what she’s saying and based on where she’s going and where she’s been, you can take the baby and rip the baby out of the womb. In the ninth month. On the final day. And that’s not acceptable,” he said. Clinton called that “scare rhetoric,” adding, “This is one of the worst possible choices that any woman and her family has to make. And I do not believe the government should be making it. Official Catholic teaching condemns the intentional killing of the unborn at any time from conception on. In 2003, Congress passed the Partial Birth Abortion Ban Act, and the bill was signed into law by President George W. Bush. The Supreme Court upheld ban by a 5-4 vote in 2007. The law prohibits a form of late-term abortion known as “partial-birth,” also referred to as an “intact dilation and extraction.” A live fetus is partially delivered and an incision is made at the base of the skull, through which the brain is removed, allowing for easier delivery of the collapsed head and the rest of the baby’s body. According to the Alan Guttmacher Institute, just over 1 percent of all abortions are performed at 21 weeks or later. Eight states already have a 20-week abortion ban. Trump has promised in writing that he would that he would sign into law a federal 20-week ban known as the Pain-Capable Unborn Child Protection Act, and also stop federal funding of Planned Parenthood, but he did not repeat those promises during the debate. Issues of personal morality — Clinton’s honesty and allegations made by several woman of sexual misconduct by Trump years ago — went by quickly.